A Sound Investment in Quality Entry level moisture analyzer HE73 and HE53 are a reliable solution for determining the moisture content of your products. 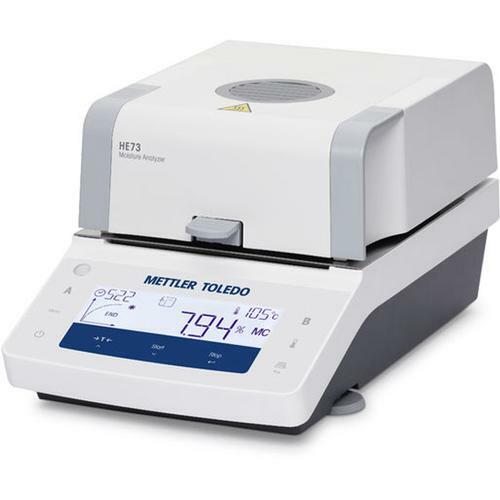 This robust and affordable moisture analyzer benefits from METTLER TOLEDOs extensive experience in manufacturing precision instruments and years of moisture analysis expertise. The HE73 and HE53 Halogen Moisture Analyzers. The HE73 and HE53 Moisture Analyzers are designed in Switzerland and benefit from METTLER TOLEDO`s extensive experience in manufacturing precision instruments. Entry Level Moisture Analyzer comes for a reasonable price with on-screen assistance, free guide and have everything you need to quickly set up and start making reliable moisture measurements within a few minutes. Get sound value for money with halogen drying technology. Robustly built for great performance for many years to come. The HE73 and HE53 deliver accurate and repeatable moisture measurements in just a few minutes. Designed in Switzerland - Benefiting from METTLER TOLEDOs extensive experience in manufacturing precision instruments and years of moisture analysis expertise, this moisture analyzer will not only give you confidence in your moisture results but also great performance for many years to come. Moisture Expertise Benefit from our know-how with everything you need to start moisture analysis straight away. more info Mettler Toledo® 11600361 Anti-theft device Steel security cord. Detachable lock with T-bar mechanism. Steel security cord. Detachable lock with T-bar mechanism. Protect your balance with this highly effective combination of visual and physical security. The device is a strong coated steel cord with a loop at one end and a detachable lock with T-bar mechanism at the other. Two keys are provided. The T-bar mechanism of the lock simply slots into the built-in fastening point on the balance (see balance manual for details). Simply connect via RS232, USB, ethernet or the optional Bluetooth. The user interface is available in 9 languages for your ease of use. P-56RUE Thermal printer supports printing on thermal paper and continuous thermal labels, and it can be connected via RS232, USB and ethernet interfaces. The state-of-the-art direct thermal printing technology is clean, vibration-free, extremly fast and exceptionally quiet. Print on thermal paper or continuous thermal label for full documentation of your results. Under proper storage conditions, the phenol-free thermal paper is guaranteed to last up to 25 years, while the thermal labels last up to 10 years. P-58RUE Thermal Printer offers statistics, formulation, totaling applications and label printing with barcode. It can be connected via RS232, USB and ethernet interfaces. Print on continuous paper, continuous self-adhesive labels or on individual labels with all sample information as well as barcodes. Print on thermal paper, continuous thermal labels or on individual thermal labels with all sample information and even barcodes. Software for Easy Results Transfer to PC. LabX direct moisture automatically transfers sample details, instrument information, drying method parameters and measurement data directly to a PC. The measurement data are automatically visualized as drying curves for the perfect overview of the drying process. Cert. temperature kit - HX/HS/HC Temperature Kit. Verify the operating temperature of the heating unit and adjust if necessary. Certified version. This easy to use temperature kit tests and adjusts the instrument at the selected operating temperature to ensure reliable results.